We're Specialists. We're Local. We're Focused. We're Effective. We're Knowledgeable. We're Safe. We Deliver .We Promise. Canadian Thermal Solutions welcomes Becca and Bugsy to the CTS family. 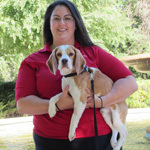 Becca Hoffman is a NEDSCA certified bed bug detection dog handler. Becca is also a certified dog trainer, receiving her certificate through the Animal Behavior College in California in 2009. Becca has been teaching group obedience classes and helping dog owners in private consultations. Becca joined Canadian Thermal Solutions in May 2012 and performed inspections with Paisley. When it was decided to add another dog to the team, she travelled to the USA and trained with Bugsy. Becca and Bugsy are a certified NESDCA team and are proud to be a part of the Canadian Thermal Solutions family.